The DS is held like a book when playing Dragon Sword. Situated between the modern Ninja Gaiden and Ninja Gaiden II, Ninja Gaiden: Dragon Sword provides a gaiden, or side story, to the series with one notable difference from those games – it’s portable. Dragon Sword was released for the Nintendo DS on March 25, 2008 and it tells of the continuing struggles of the elite ninja, Ryu Hayabusa. Set six months after the first game, Dragon Sword sees Ryu’s native Hayabusa Village rebuilt and life returning to normal when a fellow villager and disciple of Ryu’s, Momiji, is kidnapped by the Black Spider Ninja Clan. 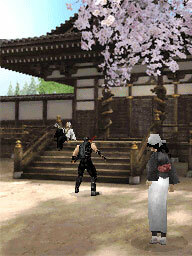 As Ryu seeks Momiji, he discovers the plans of Obaba, leader of the Black Spider Ninja Clan. She wishes to empower the evil fiends with the Eye of the Dragon, a mystical jewel that would entail certain doom for humans if the fiends were able to obtain it. Ryu’s quest for Momiji requires the collection of eight dark dragonstones; each transporting him to the next one and eventually to Momiji. Returning to Hayabusa Village between stages allowed me a chance to purchase upgrades and communicate with NPCs. Ninja Gaiden: Dragon Sword, like its predecessor, was headed up by Tomonobu Itagaki and his [former] elite ninja development studio Team Ninja. They deserve recognition for not losing the fast-paced action the series is known for in the transition to a portable, even more so considering the game makes heavy use of the DS’ touch screen. The only buttons the game utilizes are for character movement, guarding, and pausing/opening menus; everything else is handled through touch. Slashing an enemy with my stylus resulted in Ryu quickly attacking. If I slashed upwards, Ryu would launch the enemy into the air and another upward slash would see him launching after the enemy to pummel it back into the ground. Ryu’s vanilla combo contained five fast attacks and I could decimate most enemies if I was accurate. Because he streaked around the arena, attacking multiple enemies was simple to do, and reminiscent of Batman’s melee in the Rocksteady developed Batman games. These combos weren’t the only attacks at Ryu’s disposal. 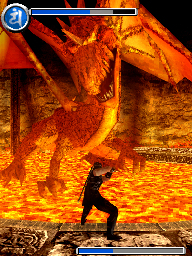 He also had some projectile attacks that were handy for dealing with weaker enemies. One attack I have a problem with is the ultimate technique. To pull it off, I had to furiously scribble on the screen, charging up this powerful attack. When initiated, projectiles targeted nearby enemies and did massive damage. It seemed hazardous to my DS’ touch screen using these attacks, but they were very helpful in clearing out rooms of weaker enemies. This attack seems at odds with the design philosophy of the series however. For a series that demands a high level of skill to succeed, the reckless ultimate techniques seem counter to that philosophy. I was always interested to see the next boss because they were so large compared to fodder enemies. It took me around five hours to complete Ninja Gaiden: Dragon Sword and I had a good time with the game. The combat was fast-paced and easy to execute. Slashing arenas of enemies was a blast and the eventual boss fights provided a change from the fodder, both in scope and strategy. The plot unfolded as one would expect, but the occasional breaks from action for plot development were still appreciated. 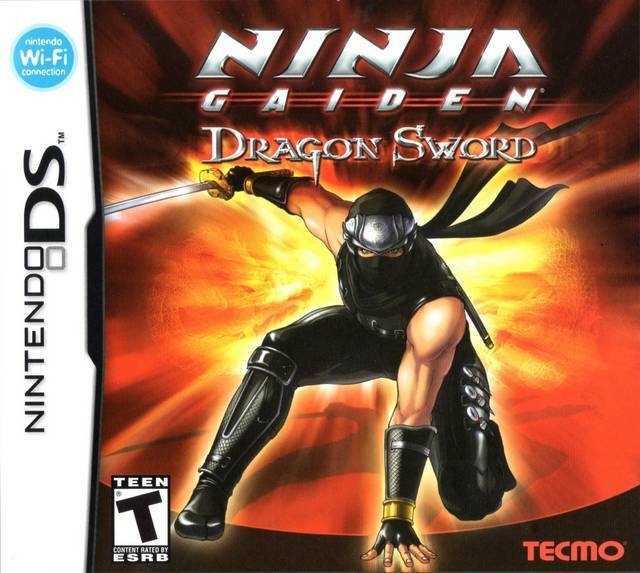 Ninja Gaiden: Dragon Sword takes full advantage of the unique capabilities of the Nintendo DS and because of the stellar implementation it remains a fantastic action game. Because it’s rather early in the semester I’ve had a lot of downtime in between my classes thus far. I’ve been using this time wisely and completing assignments, but I’ve also been bringing my 3DS. This has given me a great opportunity to play a DS game that I’ve had for a long time but never tried: Ninja Gaiden: Dragon Sword. I’m surprised how well Team Ninja was able to translate the fast-pace action gameplay of the series to a touch screen. I slash enemies with my stylus and Ryu will follow suit. Combat isn’t as refined as I what I imagine when I hear people describe the series under former head honcho Tomonobu Itagaki, but it’s very fun and surprisingly deep. My friend and I continued playing Zack and Wiki: Quest for Barbaros’ Treasure. Even though we’re only a couple of hours into it, it’s really tough. We only completed two stages and those two were mind boggling. They both took place in a snowy environment. All stages revolve around getting treasure and the first tasked us with getting treasure while avoiding a Roomba-like robot who automatically cleaned the stage of our footprints every ten or so seconds. He’d end the stage if he caught us too, but we learned that shaking trees would drop snow on our most recent footprints thereby obscuring us from the sightless cleaner. The second stage was a boss battle in which we reflected a laser through a field of increasingly fewer mirrors. It was tough and all told we spent an hour and half completing these two stages. I of course continued to play Skyrim.